market for the agriculture industry. Agriculture is usually called an industry that has much to win by securing the Internet of Things (IoT). We used to hear that it could be “the first big industrial IoT market”. Progress in technology provides farmers the capability to automatically handle actual information about the status of soil, water, crops. Though the potential of IoT to transform farming productivity, improve economic performance, and increase yield. It is best achieved when it’s linked to data analytics and machine learning. Besides of this, production costs rise including prices of seeds, water, electricity, and machinery. It is putting stresses on agribusinesses to more efficiently employ resources and increase production. Manual data gathering methods make it challenging to reach optimum levels of effectiveness, particularly given the geographic areas. Technology is playing a more significant role. The sophistication of smart sensors, internet-enabled devices, software applications, and cloud data storage facilities are providing enormous amounts and types of data. To be captured, stored, manipulated, and supplied into decision-support tools to control decisions. Proper data analysis will add meaningful value to agribusinesses. Greater intelligence is a part of the process when datasets are merged with other datasets. There are plenty of use cases that prove how combined datasets are performing greater value to farmers. For example, data collected from soil sensors and crop monitoring systems are being coupled with climate data. It is empowering farmers to make better decisions to boost crop yields. On several farms, sensors and monitoring systems are connected to automated watering systems to prepare ideal soil conditions, expedite healthy plant growth, and maximise product turnover. The livestock monitoring systems can store real-time information regarding the geolocation of the sheep. Also biometric data about activity, weight, blood, heart rate, and other parameters that can assist with decisions about health, welfare, and reproduction. 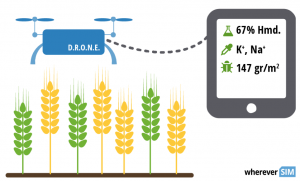 The amount of challenges ranges across various agricultural production systems, infrastructural limitations apply when it comes to IoT implementation. Many areas have poor connectivity. With comparatively higher cost and slower speed than the services available in urban areas. Lack of access to mobile coverage can be a major obstacle to technology adoption. Urging the government to justify available funding to secure equal access to infrastructure in rural areas. Most areas will have kind of 3G or 4G connectivity, but in numerous cases, it’s rather poor. It seems simple, but making the first step is tough. The first reasonable move is to follow the ‘think big, start small’ strategy. Hopefully, the Internet of Things will bring the industry where it has never been. So it is essential to develop a deeper knowledge of IoT benefits and risks during testing agriculture ideas. Keep successes and learn from failures. Constantly search a little bigger. Establish powerful techniques for better research. With precise Agriculture as Industrial IoT Market– the compensation for society can be tremendous. This entry was tagged Big Data, Enterprise IoT, Internet of Things, IoT, IoT applications, Remote monitoring, Sensors. Bookmark the permalink.